Zucchini Noodle Soup with Miso & Bacon | Simple. Tasty. Good. 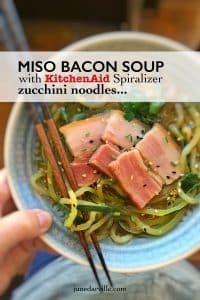 Zucchini noodles soup with miso and bacon! One can never go wrong with miso paste. How I love that tacky Japanese stuff! So it quite often ends up in my pots and pans. I love to add it to soups for example – and hey, did you know that miso is also a super fantastic meat rub! I love it especially in combination with lamb. So… zucchini noodles. Well it seems like zucchini noodles are also known as ‘zoodles’! Just google zoodles or zoodle recipes and you’ll be amazed by the popularity of zucchini noodles. Why? Well apparently zucchini noodles or zoodles are a great alternative for pasta: zoodles are healthy and gluten-free. And by the way zoodles are a superb way of adding extra vegetables to your diet! Besides, zucchini is just the perfect vegetable to shred with my awesome KitchenAid Spiralizer: it’s not too soft or too hard and you don’t need to peel the skin because the zucchini skin is not too thick or hard. Next zoodle recipe I will try out: a Chinese zoodle stir fry with oyster sauce, egg noodles and beef! Sounds like a zoodle version of my stir fried egg noodles with oyster sauce and vegetables! Back to my zoodle zuchini noodle soup! Watch my video of how I’m preparing a simple zucchini noodle soup with miso and bacon, using my fabulous KitchenAid stand mixer Spiralizer and Cook Processor! 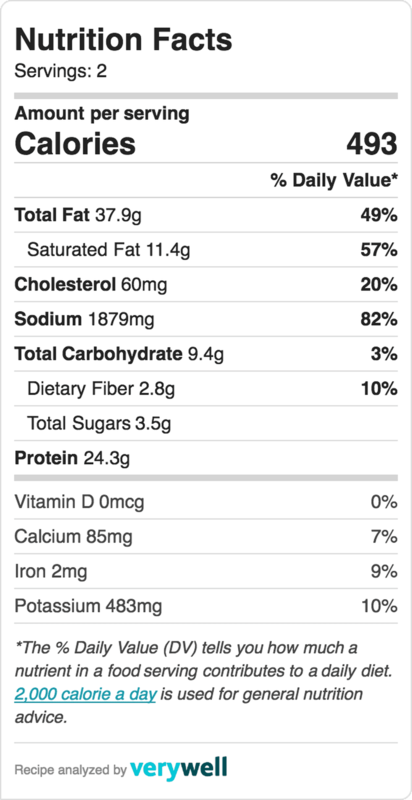 You can find the full ingredient list and recipe description below, just scrol down! Also check out my carrot noodle and shredded chicken soup I made using the KitchenAid Spiralizer! Here in Spain we have a kind of white sweet potato called batatas. I initially wanted to make my miso soup below with batata noodles since they would be white and resemble udon noodles closely. But the batata was broken up into large bits once the grater blade hit it. That’s what experimenting is all about! Don’t worry, I’ll make a batata mash later this week. In the meantime: enjoy my recipe and let me know how it was! Zucchini noodle soup with miso and bacon, I love zoodles! Attach the zucchini onto the vegetable skewer of your spiralizer. Trim it if it’s too large in length. Place a large bowl underneath it. Select the medium spiral blade and attach it to the spiralizer. Set the speed to 4. Place the bowl of zucchini noodles aside until needed later on in the recipe. Add the water, miso paste, soy sauce, sesame oil and smoked bacon strips to the bowl of the Cook Processor fitted with the StirAssist. Close the bowl. Select BOIL P1 and press Start to activate the program. Once the program is finished, press cancel to exit the keep warm mode. Close the bowl and press Quick Stir for 10 seconds. Then let the zucchini noodles rest in the hot miso soup for 5 minutes. Check the seasoning of the soup and add extra salt to taste if necessary. Scoop the zucchini noodles into bowls, place the bacon on top and drizzle with the remaining miso soup. Sprinkle with sesame seeds, extra toasted sesame oil and serve.